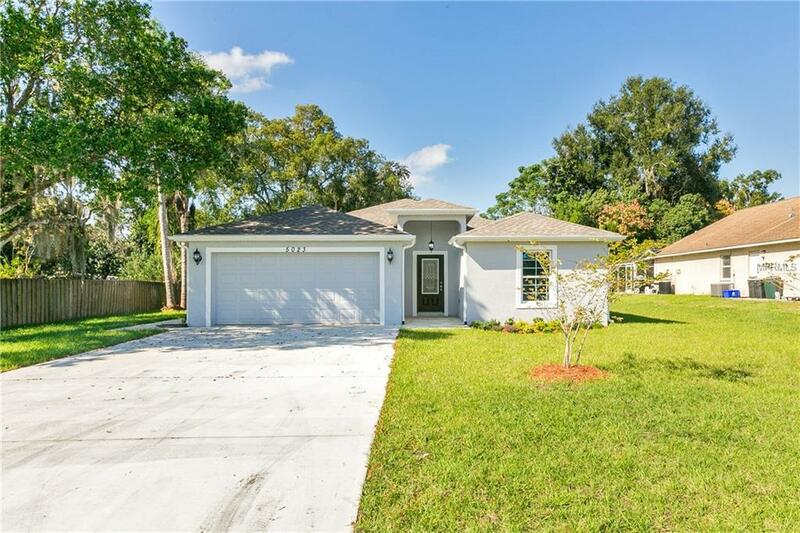 Brand new home with open floor plan centrally located in Zephyrhills! This 4 bedroom 2 bath home features many upgrades including granite counter tops, custom cabinets and tile flooring. Situated on over 1/4 acre, this home has plenty of living space both inside and out. Inside, youll be greeted by a welcoming foyer leading to the open concept living area. The eat-in kitchen features stainless steel appliances, granite countertops, custom soft-close cabinets, breakfast bar, and closet pantry. The living/dining room area is open to the kitchen, creating the ideal space for entertaining. French doors lead to the 14x7 screened lanai overlooking the spacious backyard. The master suite features a walk-in closet and stunning ensuite bathroom with his and hers sinks, granite countertops, garden tub, and separate shower. On the opposite and of the home are two guest bedrooms and another full bathroom. Other features include an 8x5 laundry room with custom cabinets, 2 car garage, ceiling fans, rain gutters, no hoa or cdd, and a short walk to Zephyrhills Train Depot Museum.